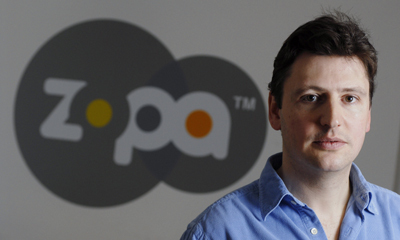 Zopa became the UK’s first peer-to-peer lender to surpass $1 billion (£595m) of lending to its borrowers. Zopa, the world’s first peer-to-peer lender, founded in 2005, has surpassed the industry milestone thanks to exponential growth in demand for peer-to-peer finance over the past year. A quarter of Zopa’s total lending (£148m) has taken place in 2014 alone. This equates to 92% year-on year-growth compared to July last year. These record lending levels highlight how peer-to-peer lending is quickly becoming a mainstream activity as more and more consumers cut out the banks for inflation beating returns and low-cost loans in order to get a better deal. Zopa currently has over 57,000 active lenders that fully embrace peer-to-peer lending as a reliable and predictable way to grow their money. The average Zopa lender is 47 years old and has lent £5,710. With interest rates at more than double the rate of inflation and five times higher than some rates offered by high street banks and building societies, peer-to-peer lending is fast becoming a popular alternative for consumers to get a better deal on their money. Zopa expects to deliver over £10m in interest to lenders in 2014 and has returned £37m in interest to its lenders since it launched. Zopa is calling on thousands of consumers to ditch their underperforming ISAs and bank savings accounts by moving to peer-to-peer lending in order to experience a better way to manage their money and earn higher returns. With no maximum lending limit consumers can lend as much as they wish and can start lending directly to real people with just £10. Zopa also has the longest track record of any peer-to peer lender in the world (9 years) and has the lowest default rate of any UK bank or peer-to-peer lender. Having approved over 104,000 loans in total, Zopa now has over 63,000 active borrowers in the UK making up just over a 1% share of the personal loans market. The most popular use for a loan is for a car (40%), which is followed by home improvements (20%) and debt consolidation (20%). A third of Zopa borrowers pay their loans back early – benefiting from there being no early repayment penalties. The average borrower is 40 years old and typically borrows £5,500.